For those who need extra storage space, garages make the perfect solution and easy addition to any home in Perth and other areas. There are many people who can’t fit everything they own into their house and need an extra place to keep their items. For this purpose, there are a few different kinds of garages that can serve as storage sheds for you and your family. The most basic template for a domestic garage is the single roller door model. As the name implies, this type of shed has only one door that moves up to allow entry into it. This type of garage is good for families that only need a little extra space and don’t need or want a large storage shed. For families who need a lot of space, sheds with two doors are recommended since they are much larger. These kinds of garages have roller doors fitted with locks, so you can safely store valuables. You can also house your vehicle and still have extra space! However, for those who want to get the most space, garages with three rolling doors offer the potential to contain up to three vehicles and plenty of legroom. Unlike the previously mentioned garages, this kind has a single door that slides left or right rather than rolling up. Generally among the larger of garages, this setup is perfect for storing heavy machinery such as gardening vehicles. It can also serve as a kind of workshop to house all of your tools in so that everything you need is in one place. 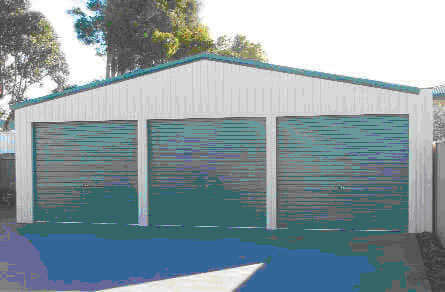 All of the garages we offer are built from basic templates. From the simple single roller door to the larger double and triple rollers and expansive and functional sliding door variants, all of our garages are fully customisable and can be built to fit any need that you may have. They also have quality designs and warranties that ensure they will serve you for many years to come. Call us on 1300 778 628 to learn more about how you can get the perfect garage for your home.